The Piers aka Tommy & the Piers frequented LA in the early-mid eighties, playing an edgie garage based variation on surf, with punk sounds, and rhythm dominated crunch. The band is Tom Zusag - guitar, Bill Nemac - bass, Cam Smith - Rhythm, and Scott Dalton - drums. 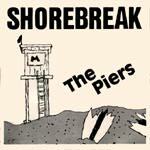 Shorebeak is a rhythm oriented progression based track with a lot of intense energy. Cries of "shorebreak" and "eat sand" are dropped in occasionally, and they accent well the chunka chunka rhythms and power. There's a tribal pounce to this that's quite appealing. major twango. This thin lead guitar track has a weak sound, but a very nice melody line. The dry tone is lacking when the high registers are played, but the middle and lower registers are quite edgie and nice. This is meant to ride the woody down the coast to. This is a progression, maybe too much of one. It seems to be waiting for a melody to appear. It is as crunchy as the nerves of steel required to shoot the pier would indicate, but it's also pretty repetitious. This is a nervous track, with irritating tones, threatening like a squall just off shore. Whiny and edgie, and gloomy. Thundering drums, chunka rhythms, and edgie intensity. The congestion of the "Zoo At Blackie's" is evident in the dashing and thrashing of this track. Sharp and looking for a break in traffic to cut through.